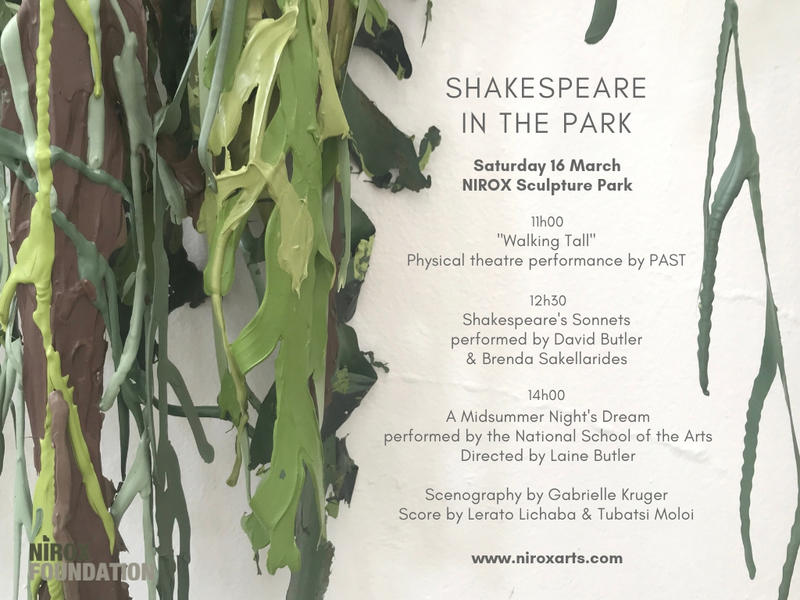 The National School of the Arts, in collaboration with NIROX Foundation presents a day of theatre throughout the sculpture park, culminating in an afternoon performance of Shakespeare’s ‘A Midsummer Night’s Dream‘ in the Amphitheatre. With scenography by Gabrielle Kruger and music composed and performed by The Urban Village. A selection of the Bard’s sonnets will be read by accomplished actors David Butler and Brenda Sakellarides on the Main Lawn. PAST presents performance theatre ‘Walking Tall‘ in the Poplar Forest to commence the day of ‘plein-air’ theatre in the park. Outstanding cuisine will be on offer from NITA’s Kitchen at the Pavilion and from the Epicurean Emporium restaurateurs. Bernie’s Bar will keep guests hydrated throughout the course of the day. Tickets R200 online; R250 at the entrance on the day – subject to availability. Pensioners & students R150 at the entrance on the day. ‘Walking Tall‘ is a physical theatre performance taking the viewer on a 13.8-billion-year journey through time presented by PAST – Palaeontological Scientific Trust. It has been performed to over 1.3 million people around the world. PAST endeavors to foster education, research and the public understanding of the sciences related to our origins. Acclaimed South African thespians David Butler and Brenda Sakellarides perform readings of their selection from Shakespeare’s sonnets – a combination of tragedies and comedies. Renaissance drama meets Generation Z in the reimagined ‘A Midsummer Night’s Dream‘, giving credence to Ben Jonson’s claim that Shakespeare was “not of an age but for all time”. The creative team behind the critically-acclaimed ‘Afro-Punk MacBeth‘, Johan Anker and Laine Butler’s adaptation of ‘A Midsummer Night’s Dream‘ is set in a South African urban plastic jungle reflecting both the attitudes and the materials of the 21st century. In a world that has become plastic and fake, just for a moment this play gives us a chance to find our imagination and to dream. Following an extended spell in the NIROX Artist Residency, South African artist Gabrielle Kruger will create the scenography for the play. Her work explores the idea of a socially and materially constructed landscapes. By utilising the medium of solidified acrylic paint, the landscape painting embodies plastic as it is liberated from its supporting canvas and frame in an attempt to deconstruct traditional Western painting. Kruger’s work aims to rearticulate the language and meaning that is associated with landscapes and the natural environment. The play’s score will be performed live by musicians in residence at NIROX Lerato Lichaba and Tubatsi Moloi from The Urban Village ensemble. Their particular sounds of ancient-futurism are brought to life through flutes, guitars, vocal synthesisers, traditional African instruments and live loops. Please note no food, drinks, pets, gazebos or sporting equipment may be brought into the park. Disclaimer: NIROX is an outdoor venue and so it is exposed to the weather. In the event of inclement weather a decision will be taken on how to proceed. No refunds.